So your new server is up and running and you have of course correctly licensed it with Windows Server 2012. Now you want to get on with the real task, installing SQL Server 2012. But what about the pesky licensing for SQL itself, well the licensing surrounding SQL Server can seem complicated initially but the basics are relatively easy to get a handle on. First of all you’ll need to purchase the server license itself. You can choose between three options here*, depending on what you need to get done. Starting at the top end, SQL Server 2012 Enterprise is what would be required for Mission Critical and Tier 1 applications, high availability and Data Warehousing. Click here for more information. 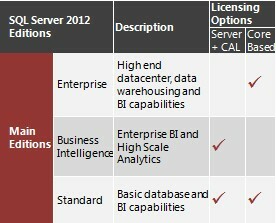 The ‘middle ground’ offering is new with the 2012 release – SQL Server 2012 Business Intelligence (BI). BI edition offers the full suite of powerful BI capabilities in SQL Server 2012, including PowerPivot and Crescent. One major focus of this edition is empowering end users with BI functionality. This will be ideal for projects that need advanced BI capabilities but don’t require the full OLTP performance and scalability of Enterprise Edition. It allows for ‘Managed self-service BI’ and scalable analytics. Click here for more information. SQL Server 2012 Standard is the entry level SQL license for small to medium network scenarios. Standard edition is designed for departmental databases that require only basic database functionality and basic BI functionality. Click here for more information. Standard suits most SMB scenarios – that said, the linked resources above should have all the information you need to decide which is right for your set-up. As with the Windows Server licensing you will also need to license each user or device connecting to the server in question. Devices and Users are licensed by purchasing Client Access Licenses, or CALs. The type of CAL needed is usually decided by which is more cost effective, i.e. do you have more users or devices? There is however another option which allows unlimited users/devices – this is known as the ‘per core’ option. As outlined above there are two distinct ways to license the CAL side of things. You can license the server and then each device or user connecting to it OR purchase a ‘per core’ SQL license. The ‘per core’ option licenses the server and allows an unlimited amount of devices or users to connect to it. If you go for the ‘per core’ model, you will need to license a minimum of 4 Cores per processor. The good news is that each license includes 2 cores, so your minimum purchase here will be 2 licenses. There is a ‘Core Factor’ that needs to be considered but in general it is simply 1:1. Learn more about the ‘Core Factor’ (PDF). A common consideration when licensing SQL is the virtual environment you might be planning. In short you will need to license each individual VM or license all physical servers for Enterprise edition. Adding Software Assurance in both cases here will enable License Mobility. License Mobility is necessary if you need to re-assign the license within a 90 day timeframe, e.g. in a server farm. This blog entry is meant as a beginners’ guide to licensing SQL as you can see, there are many nuances that can surface depending on the licensing scenario. Feel free to contact me if you have any queries or suggestions. Micromail is a Microsoft Gold Partner for Volume Licensing and provide licensing consultancy for SQL Server. *Excluding SQL Express, a product free-to-download – aimed at very small user scenario.